Bake the tomatoes 30 minutes in the oven at 220 degrees Celsius. Cut the hard pieces out and puree them in the food processor together with all other ingredients. Chill before serving. Try also the recipe for elderberry chutney, tomato-lemon chutney and MANGO CHUTNEY. Chutney comes from the Indian "chatni", which means "strongly spiced". Normally, it is made out of fruit pieces, vinegar, sugar, peppers and/or other spices. Chutney is nice with Indian food but also as a replacement of mustard with cheese. Relish is Or less the same as chutney; the cooking time may be a bit shorter though. 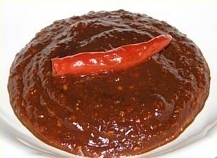 Therefore, chutney is normally softer and the sugar may be caramelized. 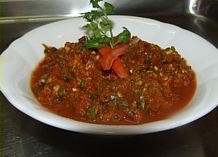 Salsa has most probably an Aztec Indian background and is made of tomatoes and chillies as main ingredients. Salsa means "sauce". Salsa is cooked shortly and is not sweet or caramelized. Cut the peppers small and mix with the rest of the ingredients. Grind very fine in a food processor, or for an even better result, with mortar and pestle. Put in a glass jar. You can keep the sambal in the fridge for 2 months.